American Alpine Institute - Climbing Blog: AAI's Communications Coordinator heads to Africa! AAI's Communications Coordinator heads to Africa! Shawn Olson, AAI's Communications Coordinator, started her journey to Tanzania and South Africa last Sunday, November 11. It's a combination research trip for upcoming AAI program and a vacation, and among her many activities will be three safaris, a trip to Zanzibar (the tropical spice island off the coast of Tanzania), and a climb of Kilimanjaro. She will be traveling with her mother, Mary Ellen Shields, who is a pediatrician and who will be volunteering in a village health clinic while Shawn is climbing Kilimanjaro. look nearly as cool as Andy when using it in Africa. 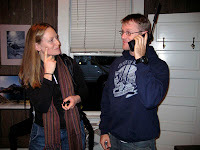 Shawn will be giving us updates throughout her trip, including daily satellite phone dispatches during her climb. We were excited to receive our first dispatch from her today! Hello Everyone! This is Shawn calling from Africa. After a non-stop flight from Seattle to Amsterdam and a leisurely change of planes there, we arrived late Monday night at Kilimanjaro International Airport near Arusha in Tanzania. We were quickly whisked away one kilometer to Kilimanjaro lodge, which is beautiful and restful and where and we had a great meal in their outdoor restaurant. plantings in the middle distance. It was dark when we got in, so we didn’t see a lot to confirm we were in a wild new land, but when we awoke at six in the morning, it was to amazing birdcalls and snarls. It kind of smells like a combo of Hawaii, southern California, and Arizona desert. It’s really awesome. We got up and drove four hours up to Gibb’s Farm, which is south east of the Kilimanjaro Airport. That’s where I am right now – just woke up, had tea, and am about to have breakfast. They have amazing meals here, and they grow all of their own food. It’s really quite posh – I was really surprised. There are tons of coffee bushes all over, and it looks really tropical, surreal. It’s really beautiful. part of Shawn’s rigorous acclimatization schedule. 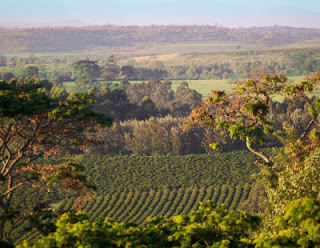 Gibb's Farm is a working farm located on the forested slopes of the Ngorongoro Conservation Area. It lies half way between Lake Manyara and the Ngorongoro Crater, near the village of Karatu, and its lands hug nearly a mile of the Ngorongoro Conservation Area, part of a 3,200 square mile reserve. It was built in 1929 and now offers accommodations in the heart of the working farm where organic coffee is grown, processed, and roasted. 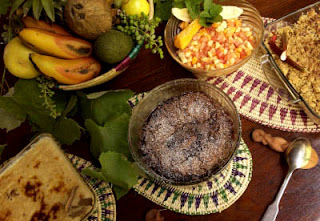 The farm's 10-acre organic fruit and vegetable garden provides most all of the ingredients needed for the home-cooked meals that are prepared for guests. The farm's panoramic views of the Ngorongoro Highlands above the Great Rift Valley include the famous caldera of the Ngorongoro Crater, a range of extinct volcanoes, and the vast Serengeti Plains. planning out final details of the Kilimanjaro ascent. Shawn will be on a Serengeti safari and trip to Ngorongoro Crater November 15-18 and will be climbing Kilimanjaro November 19-25. Then it will to on to Zanzibar and South Africa after that. Eat, eat, eat. Don't get eaten. Successful summit on Ama Dablam! 'Tis the season for seasonal ice . . .